On Friday Jan 25th, City staff released a supplemental memo specific to council’s deliberations on Red Light Cameras (RLC). This memo (see below) provides answers to many of council’s questions posed during the January Committee of the Whole meeting. This is excellent support from our traffic professionals and reiterates staff’s earlier position that the existing data on the effectiveness of RLC’s is mixed (at best) and in many cases positive reports cannot be substantiated. Further, it’s important to note that with RLC’s the driver of the vehicle is not necessarily the one receiving the ticket. Rather, the registered vehicle owner is. Often times resulting in unintended consequences for car owners who allow others to drive their car. Based on these reasons, I believe this file is best left in staff’s hands until a time when the data and technology warrants it. 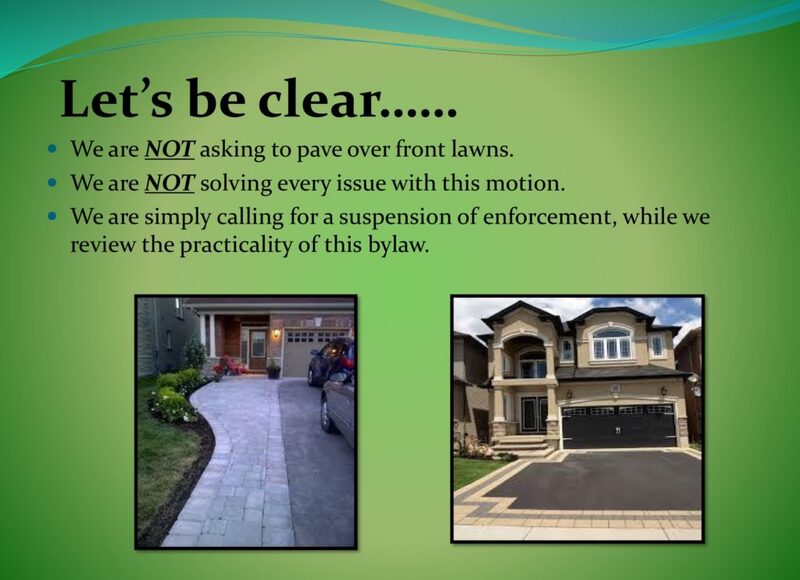 Otherwise, as seen below, council runs the risk of reprioritizing staff’s work plan away from traffic and collision mitigation measures that are actually proven to be working. Council votes on this file Monday, Jan 28th. The Red Light Camera Program Review report was put before Committee of the Whole on Monday, January 14, 2019 as report IDE-2019-13. The report provided information on the process and potential for the City of Guelph to implement a Red Light Camera program. This memo responds to questions from members of IDE Committee of the Whole and includes an alternative recommendation for Council consideration to provide clarity to Staff. 1) The City of Toronto and the Region of Waterloo cite a 60% reduction in turning movement collisions caused by disobeying the traffic control. Does the City of Guelph have statistics for turning movement collisions at traffic signals, where the traffic signal has been disobeyed (i.e. a red light running violation)? There were 1,358 turning movement collisions in the City over the five-year period between 2013-2017. Of these 1,358 collisions a total of 53 (4%) were caused by a driver disobeying the traffic control. The majority of turning movement collisions occur at midblock locations, where a driver failed to yield right-of-way. 2) Please provide further information on the ‘halo effect’, which has been mentioned by other municipalities who operate red light cameras systems. The City of London is still in the process of collecting data for a future Council report and therefore has no comments at this time on the ‘halo effect’. The City of Hamilton is noticing a Citywide decrease in collisions related to a number of traffic safety measures, but no specific numbers are statistics are available at this time. 3) Other municipalities, such as the City of Toronto, cite a reduction in the total amount of serious injuries that were a result of a collision. Can staff further breakdown the collision analysis in terms of fatal collisions, serious injury, injury and property damage only (PDO), where a traffic signal has been disobeyed? At this time, staff are unable to complete a collision analysis with this level of detail. 4) The City of London talks about an initial increase in rear end collisions, which you’ve identified, but after a while that number started to reduce because of drivers becoming accustom to seeing the red light cameras and being much more cautious going into intersections. Are staff able to get statistics on this from the City of London or anywhere else to verify? Staff was not able to find any concrete information or statistics through either independent search or directly from other municipalities to verify this statement. 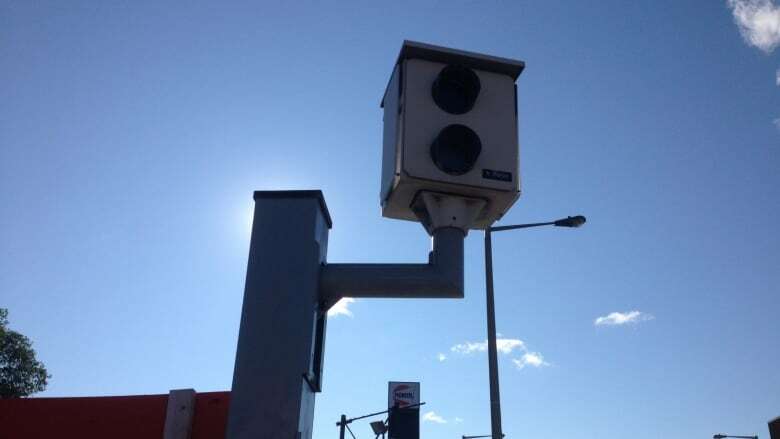 5) Although there are statistics on the potential benefits and drawbacks of a red light camera system in the report, there are no statistics on the programs and initiatives that staff are currently working on or would like to implement. Do we have these statistics from our programs here in Guelph or is staff able to get these from other municipalities? – 48% reduction with installation of larger signal heads (all 30cm lenses). This practice was started in the City of Guelph in 2012. – 42% reduction with installation of additional signal head (often on the far left of intersections). 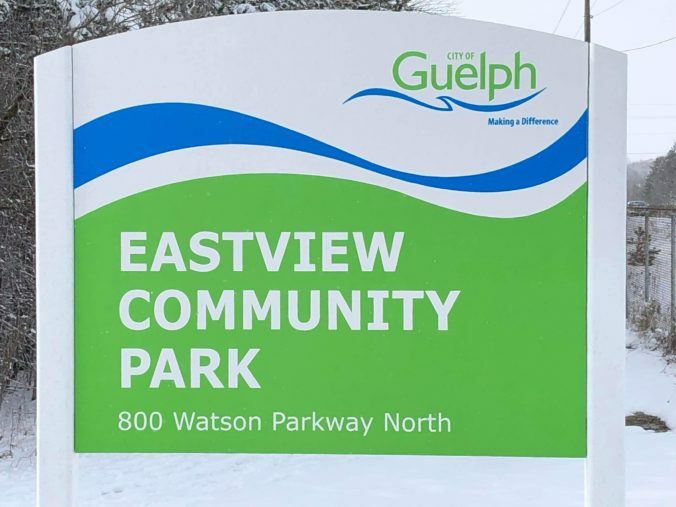 This practice was also started in the City of Guelph in 2012. – 25-38% reduction with the coordination of signals. (Staff are updating the signal coordination plans for Gordon Street, Edinburgh Road and Woodlawn Road as part of the 2019 Workplan). 6) Is there a possibility to purchase one red light camera, but sign multiple intersections, without a red light camera, warning of ‘Red Light Camera’s May be Used’? No, it was decided by the RLC working group that the program is to be transparent. In fact, all the participating municipalities actually highlight the RLC locations on their website.In light of the limited potential of any deterrent effect, as well as the potential negative impact on the integrity of the city’s ‘real’ red light camera program, staff do not recommend the installation of ‘mock’ red-light camera sites. 7) The report shows a tremendous emphasis on damage to property, but the threat to humans or animals is not as significant. Could staff please comment on this and provide the potential benefits for both pedestrians and cyclists on the installation of a red light camera system. 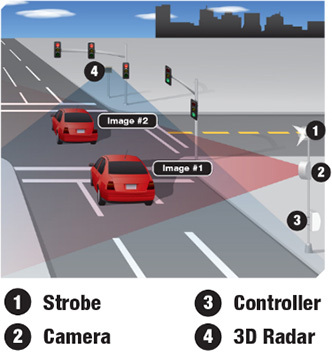 Statistics indicate a Red Light Camera program has proven to reduce right angle collisions by 25%. This includes right angle collisions with pedestrians and cyclists at signalized locations. 8) Could you please provide further data analysis on the right angle versus rear end collisions, because it is my understanding that we are being asked to weigh each. While the majority of collisions occurring in the City of Guelph are rear end (3,060 over the past 5 years), a right angle collision (1,215 over the past 5 years) is considered to be more severe. 9) It is understood that one of the drawbacks of a red light camera system is an increase in rear end collisions. Through Councilor Downer, it was stated that over time those rear end collisions tend to drop off as people drive more cautiously and slowly through intersections. Could you please corroborate this information? Staff was not able to find any concrete information or statistics, through independent search or from other municipalities, to verify this statement. 10) The math in the financials part of the report is wrong; staff need to come back to Council with correct number on cost and revenue. 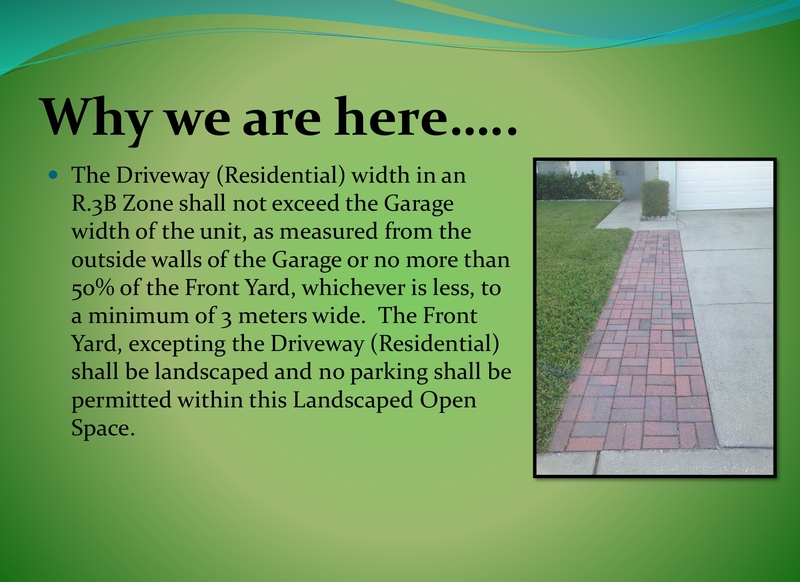 The way it is currently displayed in the report, the program is not presented as being revenue neutral. The numbers in the report are correct. For a RLC program to be fully funded through the fine revenue collected for RLC violations, an average of approximately 0.56 violations per camera per day (assuming four locations total) would be required. Since the number of red light violations is difficult to predict, especi ally in the early years of operation, the program needs to be viewed as a safety initiative as revenues are not a certainty. Based on four red light cameras being installed, the minimum cost to pay for the system would be an annual operating cost of $213,000 (based on an approximate of $52,000 per camera), plus communication costs. With a maximum of $260 (from the $325 ticket, $60 is a victim surcharge retained by the Province and $5 is assigned for court costs) being returned to the municipality (an agreement must be reach with the Courts department first), all operating costs from the program could be funded with an average of 0.56 violations per day, if the maximum fine was returned to the City. Other municipalities have indicated in some cases the fine is reduced. 11) Please look at the City of Hamilton’s model that has all extra revenue pooled into a traffic safety fund for road safety initiatives. The City of Hamilton has an agreement with the local court system that the ticket revenue ($260 from each offence) is returned to the municipality and placed into a set account/fund. Should the City of Guelph approve the Red Light Camera program, staff will report back with further information on this process. 12) Could you please explain the difference, and costs, in either entering the agreement with the other municipalities or going out to find our own vendor and running the program without entering the mentioned agreements? Exact costs on ‘sole sourcing’ the red light camera are not available at this time. 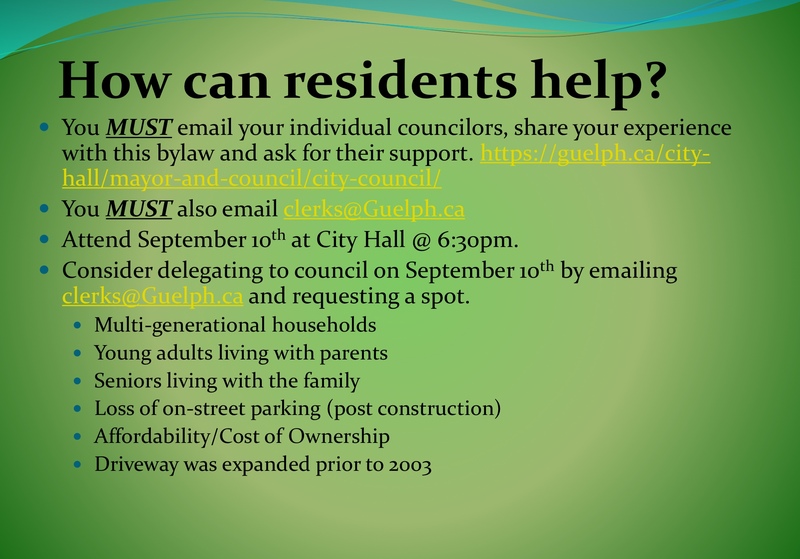 Should the City of Guelph wish to proceed with the red light camera program without entering into the agreement shared with the other eight municipalities, the following items would need to be considered. 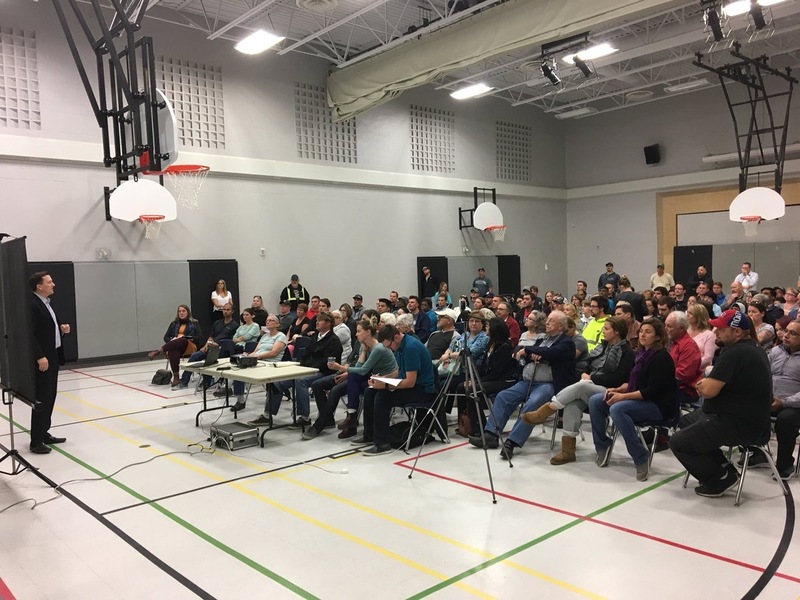 Based on the above and in discussion with other municipalities, it is recommended that the City of Guelph join the other participating municipalities in contracting for a red light camera system. 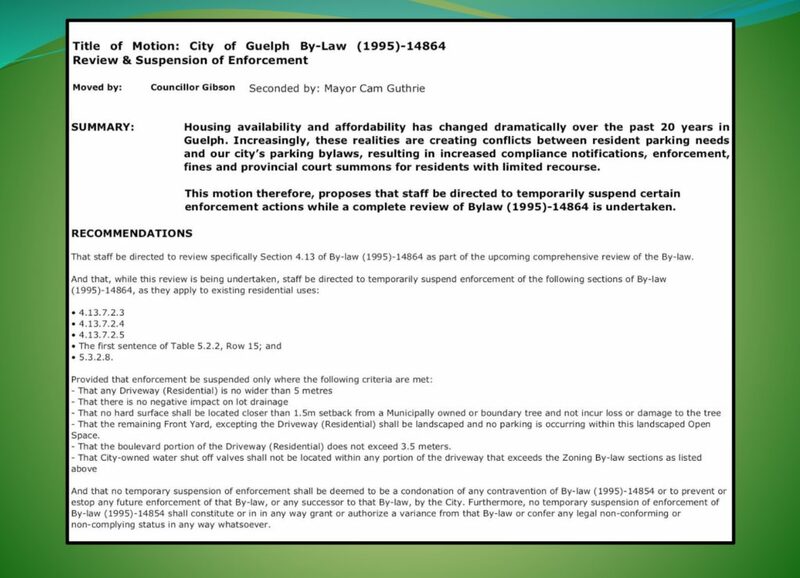 13) Should Council approve the red light camera program for the City of Guelph, what will be lost in both staffs Workplan and the budget, to ensure the programs implementation? Much of the Traffic Division staff Workplan involves working on time sensitive projects, such as development related traffic reviews, traffic control plans and construction reviews, assisting the Adult School Crossing Guard program and inspections of ongoing capital programs. It is anticipated that staff’s ability to complete service request reviews (i.e. 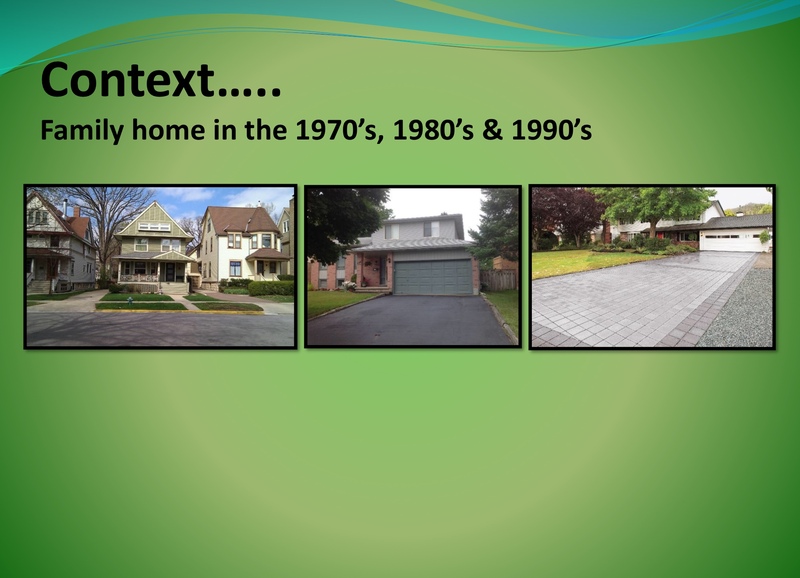 neighbourhood speeding, on-street parking concerns etc.) would be impacted the most with turnaround time be extended from approximately 4-6 weeks to 8-10 weeks. 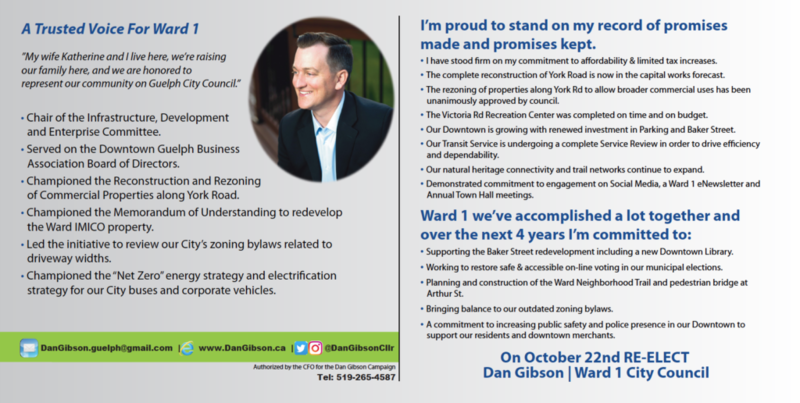 Ward 1 it has been an honour to serve as your councilor since 2014. We’ve accomplished a lot together and on October 22nd I ask for your support again. * 2016 appointed as Chair of the Infrastructure, Development and Enterprise Committee (IDE) for the City of Guelph. Dan’s professional career necessitates that he works with stakeholders from all viewpoints in order to balance the many social, economic and environmental aspects of complex issues. On a personal note, Dan and his wife Katherine are committed financial partners of Lakeside Hope House in Downtown Guelph. They are also firm believers in the foundational benefits of affordable home ownership and Katherine currently serves as Chair of the Board for Habitat for Humanity (Wellington/Dufferin/Guelph). THE PLATFORM: The realities of housing affordability, raising a family and retiring in a modern City like Guelph have changed dramatically over the past 20 years, and I believe these realities need to be reflected on City Council. * continue proactive engagement through regular Town Hall meetings, two way communication, and social media. 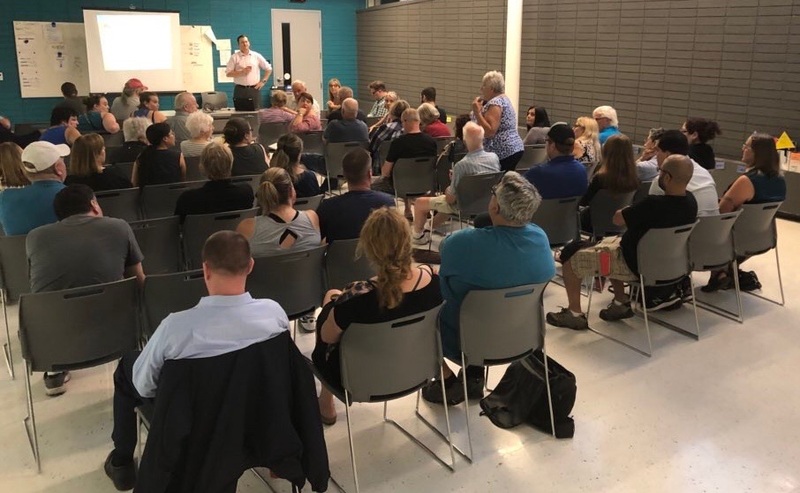 In summary, I believe municipal government is intensely local and that strong, transparent and independent councillors are what’s needed at City Hall. Like so many others, I am motivated by the belief that to live and raise a family in Guelph means to invest in Guelph; not just through taxes and fees but also through time and service to our community. On that note, my wife Katherine and I live in Ward 1, we’re raising our two boys (Luke and Marcus) here, and it’s been an honor to serve our community in this role since 2014. Update on the Driveway Width Bylaw Review | First Vote is Monday July 23rd! 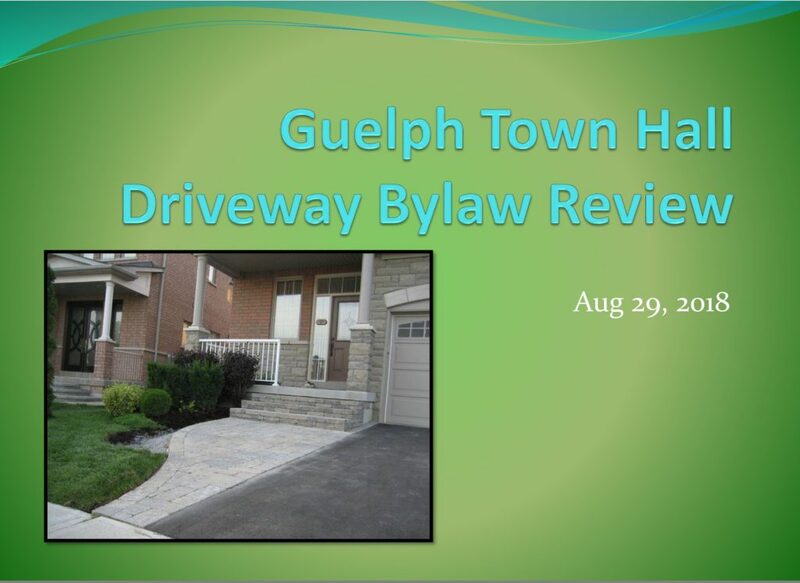 A sincere thanks to the hundreds of Guelph families who have been reaching out to me on this issue since June. 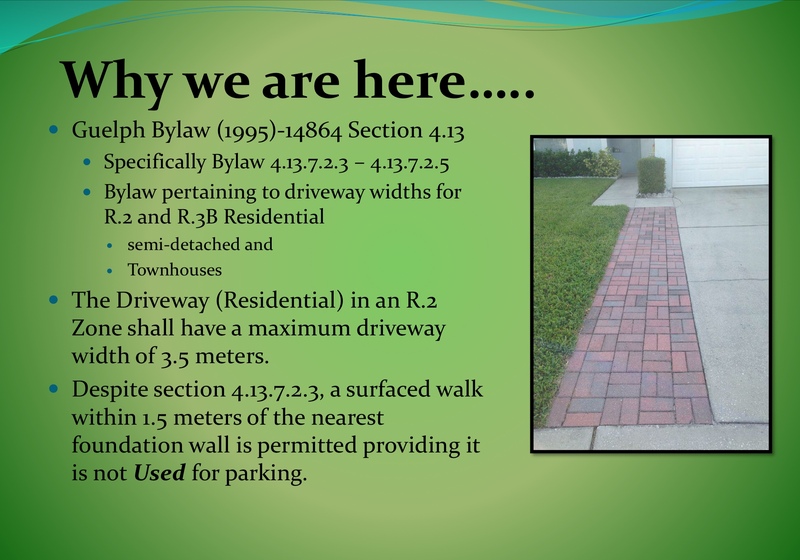 I’m having informative and supportive conversations on a daily basis with residents who are sharing their stories with me and are motivated to help bring some reasonableness to the driveway issue in our City. 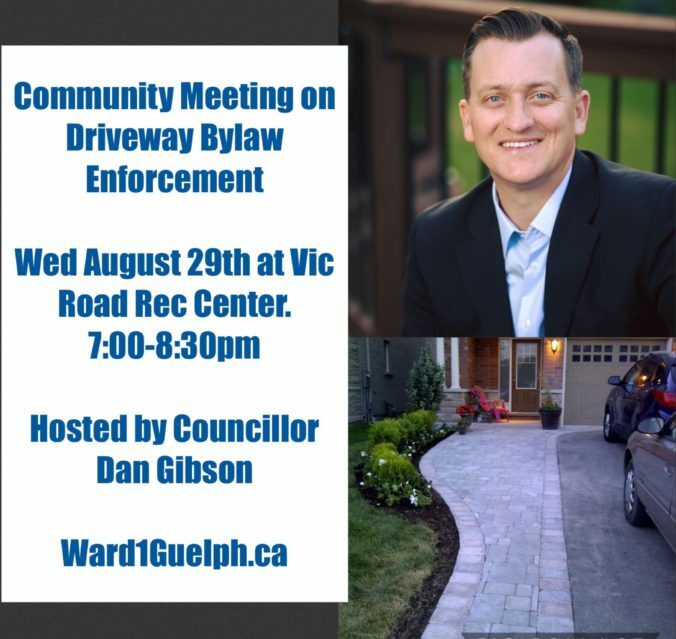 Many have been asking how they can help, so here’s goes…..
On Monday July 23rd Council will take the initial vote on the motion. It’s largely an administrative vote (no debate) but it is essential to getting the issue of a Driveway Width Bylaw Review onto our September council agenda. If the vote fails on Monday, the agenda item does not move forward. It’s that simple. If the vote passes however, the motion then proceeds to the September meeting where council will hear from the public, debate the motion and ultimately rule on the recommendation. That’s why I need your support this weekend. If you haven’t already done so, please consider emailing your Ward councillors expressing your support for the motion. Please be civil, diplomatic and reasoned. I’ve been so impressed with the level of decorum shown by our community throughout this process, and I’d be even more proud if we kept it that way. One of the reasons I continue to champion the concept of Net Zero emissions for our community by 2050 is the “all above the above” energy and environment strategy that it encompasses. An approach that doesn’t just fix us on certain technologies, but allows a broader conversation that incorporates ecosystem services in our pursuit of Net Zero. 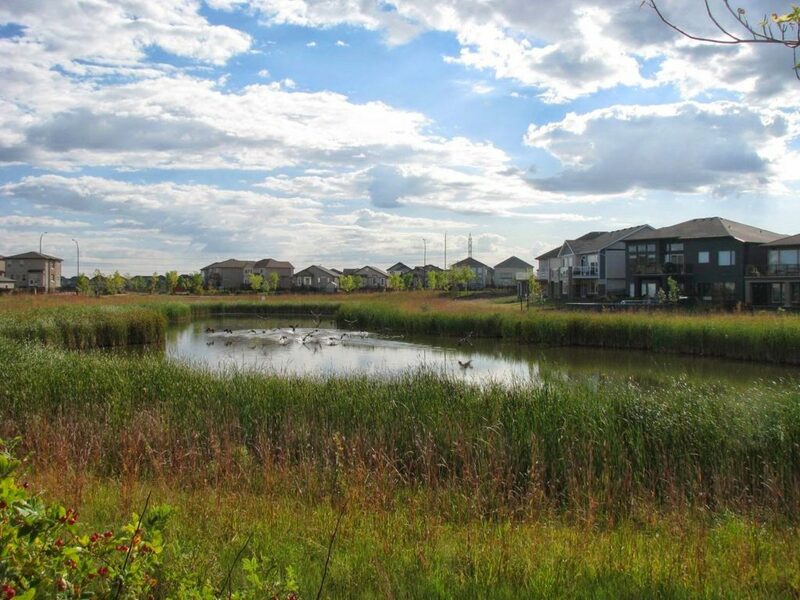 To this point, on Tuesday July 3rd Council received an update on the development of our City’s Natural Heritage Action Plan (NHAP) from staff. 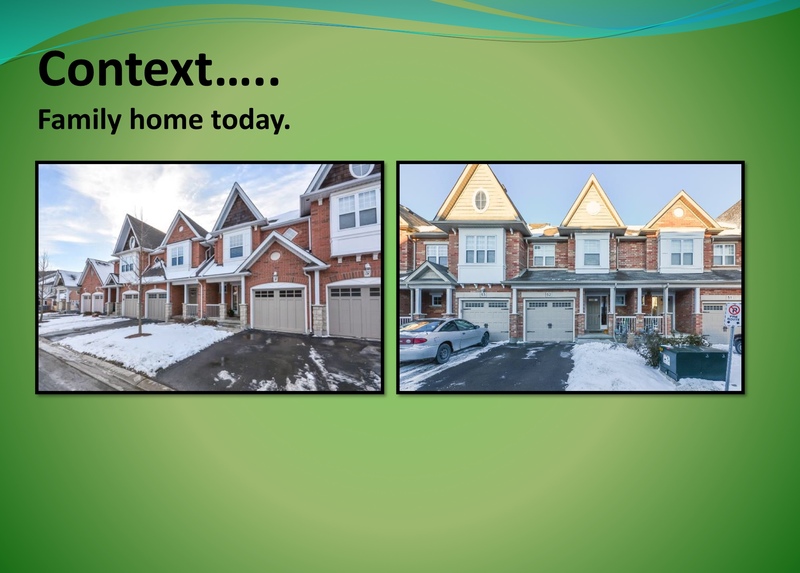 During discussions I drew connections between our NHAP and our 2050 Net Zero target. Below is a short video highlighting the conversation. Thanks to all who have contributed to the NHAP to this point and I encourage all those with an interest in energy and the environment to join the conversation. To learn more about the NHAP you can follow this link and get involved.